Jay Loecken grew up on an eighty-acre hobby farm in Minnesota as the youngest of three boys. His upbringing was solid with loving parents who were always encouraging him to try new things. He grew up in a Christian home, but his faith really began to develop during his sophomore year at Northwestern College while living in Dublin, Ireland for the summer and working with Greater Europe Mission. That’s when the Bible began to come to life for him and he began developing his own convictions. Beth Loecken’s upbringing could not have been any more different. She grew up in Kansas City in a Catholic home as the youngest of six children. Her mother battled depression and eventually committed suicide when Beth was only five. Beth’s father retreated into alcoholism, leaving her in a chaotic and unstable environment where she was often abused. After graduating from high school, she moved to New York where she discovered her first true love—Jesus. He offered her a love and redemption she had craved her entire life. 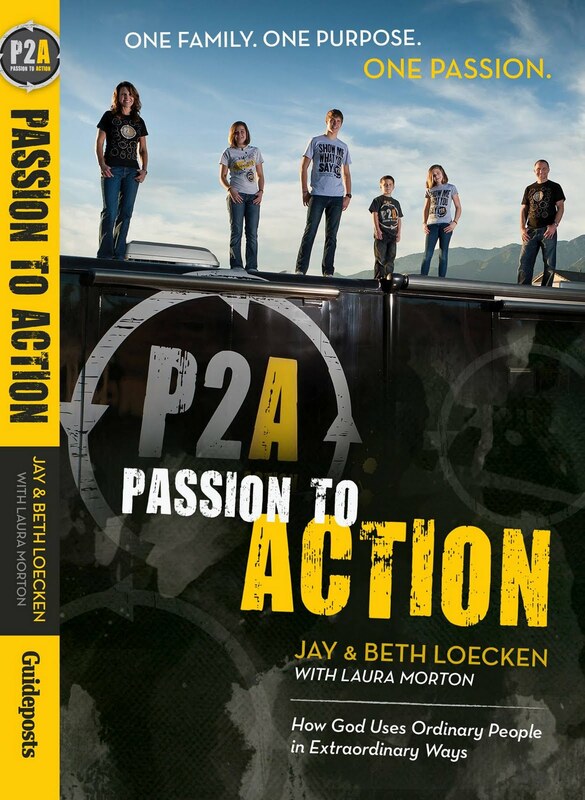 Jay and Beth Loecken were an ordinary family searching for meaning in their lives while living the American Dream. They owned their dream house, drove nice cars, and from the outside seemed to have all they needed. Yet something kept pulling at them—a stirring, a sense that they were being called to a greater purpose in life. They couldn’t escape the feeling that there was more to life than the relentless pursuit of material possessions. BETH» Something unsettling had been stirring in our hearts for a very long time. We both knew we wanted—no, make that needed—something more out of life than what we had already achieved. By all definitions, we were living the good life: privileged and full of prosperity. Jay’s business as a mortgage broker had afforded us a very comfortable lifestyle. We owned a forty-five-hundred-square-foot house in Alpharetta, Georgia, that was our dream home—right down to the perfect and beautifully landscaped backyard we had just finished putting the final touches on. Although we weren’t wealthy, we were quite comfortable. We were actively involved in our church, had a great family life, and were living a pretty good existence. Our four children didn’t have to wear secondhand clothes. We were able to take the entire family to the movies and out to dinner whenever we wanted to without thinking about the cost. We pretty much had the ability to have whatever we wanted at the drop of a hat. Along with our home, we owned two cars, a motorcycle, and were close to purchasing a new boat and convertible BMW. For years we gave ourselves almost every luxury a family like ours could hope for. Our lifestyle had become what you might think of as ideal—the American dream personified. Yet with all of the success we had achieved, and although we were generally happy, we were not feeling fulfilled. There was a void in us—an emptiness that living only for oneself brings. We weren’t comfortable living caught up in what other people thought of us. While Jay was making loads of money, we trusted in our finances instead of God. If or when we had a need, it was taken care of without a thought. We were living the dream—right? The only problem was that we no longer needed to depend on God. It was easy to stop trusting in Him for provision and relying on Him for our needs. Our relationship with Jesus became less desperate and, at times, stagnant. Four years of living the dream and still, we couldn’t shake an ever-present feeling that kept tugging at Jay and me. Simply said, we knew there had to be more; but we had absolutely no idea what it was we were looking for. There was a void, a longing, an empty place deep inside of us that seemed to quietly whisper that our lives were missing “something.” We thought the something was more stuff. We had struggled financially for years prior to coming to Atlanta, and the fact that we could buy new furniture and make all the updates to our home without a thought felt good. We thought the something that was missing from our previous financially strapped life was things: a comfortable lifestyle, kids in sports, nice clothes, a nice neighborhood, and a settled life. The only problem was that once those things were all purchased or attained, they seemed to breed more discontent. One purchase or update led to another and it went on and on. The something was never filled; in fact, material things seemed to make the ache grow deeper because they caused us to realize that we would never be filled that way. When our life would finally quiet down (typically on a Sunday), and after hearing a great message at church, we would follow the thousands of others who filed out of church, jump in our nice car, and head home. But we began to notice a deep loneliness and hollowness. We felt sadly alone, empty, and purposeless. We never felt this way when our life was hurried and chaotic. In fact, when we noticed the emptiness creeping in, we would busy ourselves around the house, cleaning, organizing, “doing” so that we didn’t have to answer the ever-noticeable voice we both heard calling to us. In many ways, we didn’t want to face the questions that were rising up inside of us. Is this really the abundant life? The ache was not there in the beginning; but as our dream life ended up not being the big deal that we thought it would be, it began to grow and grow in our hearts. I think we glamorized what having money would be like. I believe we thought that all of our financial worries would be over, all of our longings would be fulfilled, our hearts would be content, and our relationships would be rich. That couldn’t have been further from the truth. The more we owned, the more stress and responsibility we had. The more things we filled our life up with, the less time we had for deep relationships. Once we had money, we stopped praying about whether to purchase items. It was simple, did we want it? Check. Did we have the perfect location in our house for it? Check. Could we afford it? Check. Our evaluation process did not involve God in any way. Our needs were met simply by Jay working harder and longer hours. The harder he worked, the bigger his paycheck was. We made sacrifices and began to place money and material things in front of family time and our marriage. I didn’t get upset or nag him when he would come home at eight o’clock when the kids were slipping into bed—because, selfishly, I wanted to live the life we were living. I wanted to be able to finish our basement and drive a nice car. It was a vicious cycle, and it slowly began to chip away at the foundation of our marriage and family. When times are good, you think they will always be good and you often don’t or can’t see what’s around the corner. But something clicked when we started to think about the dreams for authentic living that we had given up. We somehow saw that what was happening was the complete opposite. We realized that we had let the deceitfulness of money creep into our lives. We knew we needed a change. In an effort to clearly understand what was missing, we decided to spend a weekend alone at our friends’ condo in downtown Atlanta. We needed a change of atmosphere to focus on figuring out our next move. The friends who offered us their condominium agreed to watch our children for the weekend up at our house. A weekend in the suburbs sounded pretty good to them—even with four kids who were not theirs! While most couples would take a weekend away from their kids to enjoy each other’s company, check out the newest trendy restaurant or nightclub, or just blow off a little steam, we chose to do none of those things. Our weekend was devoted to figuring out what it was we wanted to do with the rest of our lives. We went on long walks and shared our deepest thoughts and feelings about life, fulfillment, and our discontent. As we spoke, we both realized that we no longer wanted our lives to be about ourselves. It’s hard to imagine that the parents of four young children could possibly feel selfish in any way—but we did. We were always present as parents, but our thoughts rarely extended beyond the white picket fence that surrounded our peaceful and sheltered existence. We had a deep desire to make our lives about something so much bigger than our tiny little bubble we’d been living in. We talked about all of the friends we’d made over the years and how we each craved deeper relationships than we shared with most of them. I look back on the early years of our marriage when we had very deep, rich relationships. What was different back then? Why didn’t we have that now with couples in Atlanta? I think the number-one factor was time or the lack thereof. It takes time to build a friendship and to grow close to people. When we were first married, we had time. Looking back, I can’t believe how much time we had! Now, years later, we had four kids, a busy family, and a hectic lifestyle. Free time was a thing of the past. We often reminisced about the “good ol’ days” when life was simple and relationships and time with other couples came easy. We began to realize that we wanted a different version of our old life. We wanted simplicity, deeper relationships, and time. The other obstacle to forming deep friendships was our willingness to be vulnerable and open with our lives. Jay and I have always been open people who lay everything out on the table. Some people simply don’t like that. It makes them uncomfortable to talk about their feelings, mistakes, or marital disagreements. We find it refreshing because—let’s face it—we all have struggles. We have never really enjoyed being around people who give the impression that they have it all together. This type of phoniness leads to artificial relationships that never seem to go anywhere. We had a hard time finding like-minded people we meshed with in Atlanta too. We are very simple, down-to-earth people, and we felt a little out of place living the “big lifestyle.” We would go to events and parties and feel like we didn’t fit in. Jay doesn’t wear penny loafers, and I don’t wear designer clothes. We prefer Converse sneakers, Target, and knock-offs. Often we would find ourselves gravitating to the members of the band performing at the parties. At the time, hearing about their broken marriages and past drug addictions, they were the only ones we could see who seemed real. That was more real to us than trying to keep up with shallow small talk that seemed to inundate the events we attended. We tried to fit in, wear the right clothes, say the right things, rub shoulders with the right people; but at the end of the day we were empty. We realized that we are really just who we are—simple, average people—and we will never be happy being people we are not. We were created to be in relationships: first and foremost with God and then with people. Most human beings crave love and desire to be known. Some of us may not admit it, but it’s real. We need each other. Although we did not find the depth of relationships we were seeking in Atlanta, I personally found that connection with two close women friends. Jay, however, did not; and that took a toll on him. Yes, we have each other and we are best friends, but sometimes a guy just needs to be with “the guys.” They need to play golf, talk about work, and relate on a man-to-man level. I couldn’t offer Jay what he could only get from someone who walks in his shoes. He did stay in contact with other close, out-of-town friends, and that seemed to fill the void. After two days and endless hours of dialogue, we knew there was a higher calling reaching out to us. We wanted to somehow give back for all of the good fortune and blessings God had bestowed upon us. Our decision was to find a mission trip through our church that would give us the opportunity to do something for those in need and the poor. We had both seen images on television with the beautiful and innocent faces of African children in need. Who among us can honestly say those unforgettable photos don’t move you or tug at your heartstrings? We can’t explain our attraction and the heart we had for Africa other than just knowing in the deepest part of our souls that this was where we wanted to go to be of service. We knew seeing those faces live and in person would make their plight all too real; and, therefore, it would be a life-changing experience. Of course, at the time, we had no way of knowing just how far it would take us away from the only life we had ever known. When we started looking into mission trip options, the only destination our church was currently offering that allowed families was to China. No offense to China, but we didn’t want to go there. Frustrated and unsure of what to do next, we prayed about our desire to serve in Africa until one day, not long after we made the decision to do this type of mission work, we spoke to Jenny Strange. She was one of several people responsible for mission trips at North Point, our church. North Point Community Church is a large church in Alpharetta, Georgia led by Pastor Andy Stanley, the son of Charles Stanley. Andy started this church in 1995 not because Atlanta needed another church, but because he wanted to create a safe place where people who were seeking the truth about Jesus Christ would feel comfortable attending. I think he was successful because North Point now has over twenty thousand people who attend their weekend services. The missions department decided to open up a trip for families to Africa. The mission was going to be a joint effort between North Point Community Church in Alpharetta, Georgia, and 410 Bridge, an organization that partners people and groups with communities in Kenya. This was exactly what we hoped to find. As we continued to discuss the opportunity, Jenny told us she was still looking for someone to actually lead the trip. “I think you’d be perfect for it,” she said, as she and Jay spoke over the phone. We hadn’t thought about the responsibility that comes with leading such a trip, but we also knew God works in very mysterious ways. Everything happens for a reason. If being a leader was what she was asking from us, then who were we to turn her down? We spent the next six months preparing for our trip. We were headed to a tiny village two hours north of Nairobi called Kiu. When the word spread that there was a missions trip to Africa, several local families reached out to express their interest in participating with us. We had the rare and fortunate opportunity to handpick the people we thought would comprise the very best team. After many hours of meetings and deliberations, we decided on six families who would join us on this journey, with a total of twenty-two of us altogether. We planned to take our three oldest children—Ben, Bekah, and Abigail—with us. It was difficult to leave Noah, our youngest son, behind; but he was only four years old at the time, which we felt was too young to make this type of trip. Working closely with 410 Bridge, we were able to assess exactly what the community we were going to serve wanted from our group so we could work together with the locals when we arrived. We discovered that these types of trips are highly organized. There was a tremendous amount of communication with the village prior to our arrival. After months of dialogue and preparation, the people in Kiu decided that our goal for the ten days we would be there was to build a chicken coop that would house twenty-five hundred chickens. Undertaking this type of project had several benefits to the locals. First, it would provide a steady source of nourishment. Second, involving the locals meant there would be a common project aimed at getting their troubled youth off the streets. Third, building the chicken coop would provide them with some sort of a business enterprise so they could sell the eggs and, eventually, the chickens. As the mission trip grew closer, we tried to imagine the journey that was ahead. We counted our blessings for the opportunity we had—not just ours, but also for the experience we were about to give to our children. When we first signed up for the trip, we thought our group would go to Kiu and help the people with their project in a tangible way while building some new relationships. This experience was the first time we realized the importance of working alongside a community instead of coming in and imposing on them what we think or how we live. The people from 410 Bridge did an excellent job preparing us for the trip. They gave us a very strict list of dos and don’ts so we didn’t make any colossal errors in judgment. They explained to us that no matter how badly we desired to make things better for the people we were about to meet, our mission was to go in and build a chicken coop—working alongside and developing relationships with the African people. They told us not to give the children shoes because their feet had toughened up from years of surviving barefoot. Once they start to wear shoes, their feet can no longer take the extreme conditions because they soften up. What we would have perceived as doing something to help them would actually hurt them in the long run. Helping them adjust to our contemporary lifestyle wasn’t the reason we were there. Our Western mentality and mindset is to fix things, throw money at the problem until it is no longer of concern, and basically make it all better. It’s hard to come up with a solution when we don’t necessarily have a full understanding of the problem or their way of life. We quickly discovered that our way of thinking doesn’t solve their problems. Long-term change comes with time, perseverance, education, and dedication. The people we were endeavoring to meet had the same drive, initiative, desire, and ultimate goals we did but lacked the resources to facilitate those ideas. Helping provide those resources was the main purpose of our presence in their community.